That CITT/ICTS establish a steering committee on national certification standards for the entertainment industry in Canada. The Committee should include members from other industry associations. The Committee will base its work initially on existing national, provincial, international documents and seek funding to establish accredited national standards. Members interested in participating or being on the committee should include: CITT, PACT, CAPACOA, CQT (TAI, ACT, APTP, TUEJ, etc.) and associations of theatre schools, ESTA or Canadian equivalent. Over 15 members present at the conference expressed their desire to become involved with this initiative and to follow through its implementation. The next day, on August 18 at the CITT incoming board meeting, the board of directors passed a motion supporting this endeavour. The CITT Québec Section CQICTS held a similar panel discussion at its Rendez-vous technique on September 4 in Québec City, with the same positive response from its members and reported the findings back to the CITT Board of Directors. Both groups did however raise questions and concerns about how the system would be set up, what would be the modalities and how it would be funded. These issues should be addressed by the Steering Committee. 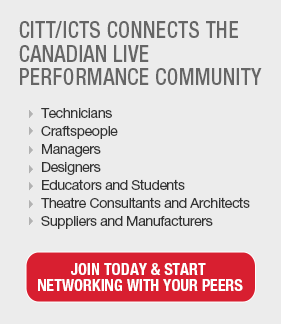 A draft proposal (with a working title) for a "Professional Recognition and Competency Assessment Programme for the Live Performing Arts Technicians in Canada" was presented to the CITT/ICTS Board. Although not been completely reviewed by the board, it was decided that it would be shared with the CHRC Theatre Technician Steering Committee members, which include representatives of CAPACOA, CITT, IATSE, NASCO, PACT, as well as from the Canadian dance, opera and music industry. The document outlines the project objectives and time line, plus there is a 20-page Appendix on national and international charts of competencies and national standards programmes that exist worldwide. The document is drafted in both English and French. So far we’ve received positive comments and feedback from the Steering Committee members.